16a). Frigates, Loch class & later "Bay" conversions. This complete section added :- February 2003. Photo's added and updated - Mid November 2010 - ( # ) against entry indicates new photos. 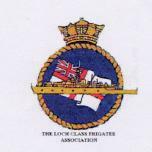 with special thanks to the "Loch Class Frigate Association". for their information and help. where the threat was mainly airborne rather than submerged. 1). - Loch Achanalt. -- later renamed HMNZS. Pukaki. - 2 photo's. 2). - Loch Achilty. -- " " HMS. St. Brides Bay. - 2 photo's. 3). - Loch Achray. -- " " HMNZS. Kaniere. - 3 photo's. 5). - Loch Arkaig. - 2 photo's. 6). - Loch Arklet. -- " " HMS. Start Bay. - 1 photo. 7). - Loch Arnish. -- " " HMS. Tremadoc Bay. - 3 photo's. 8). - Loch Bracadale. - " " HMS Enard Bay. - 1 photo. 10). - Loch Carron . - " " HMS. Surprise. - 4 photo's. 13). - Loch Eck. " " HMNZS. Hawea. - 1 photo. 14). - Loch Eil. " " HMS. Dampier. - 1 photo. 15). - Loch Fada. - 1 photo. 17). - Loch Frisa. " " HMS. Widemouth Bay. - 1 photo. 18). - Loch Fyne. - 1 photo. 19). - Loch Glass. " " HMS. Dalrymple. - 2 photo's. 20). - Loch Glendhu. - 2 photo's. 22). - Loch Insh - 3 photo's. 23). - Loch Katrine. " " HMNZS. Rotoiti. - 3 photo's. 24). - Loch Kilbernie. " " HMS Mounts Bay. - 1 photo. 25). - Loch Killin. - 1 photo. 26). - Loch Killisport. - 2 photo's. 27). - Loch Laxford. " " HMS. Cardigan Bay. - 1 photo. 28). - Loch Lomond. - 2 photo's. 29). - Loch Lydoch. " " HMS. St. Austell Bay. - 3 photo's. 30). - Loch Mochrom. " " HMS. Cook. - 1 photo. 31). - Loch Morlich. - 1 photo. 32). - Loch Roan. " " HMS. Cawsand Bay. - 1 photo. 34). - Loch Scarnadale " " HMS Dundrum Bay / Alert. - 5 photo's. 35). - Loch Scavaig. - 1 photo. 36). - Loch Seaforth. " " HMS. Porlock Bay. - 1 photo. 37). - Loch Shin. " " HMNZS Taupo. - 2 photo's. 38). - Loch Swannay. " " HMS. Veryan Bay. - 2 photo's. 39). - Loch Tarbert. - 1 photo. 40). - Loch Torridon. " " HMS. Woodbridge Haven. - 2 photo's. 41). - Loch Veyatie. - 1 photo. "Type of Ship" index page.